My son is a committed carnivore. So much so that he was plunged into an existential crisis once when asked, “If you had to pick just one kind of meat to eat for the rest of your life, what would it be?” He debated the relative merits of bacon versus chicken versus pork for hours. Even though that was years ago, imagine our surprise when he took a job last fall as a member of a mostly vegetarian crew doing conservation work in state parks. We didn’t expect him to survive. And yet—he has thrived. Sure, he still stocks up on burgers on the weekend, but during the week he’s found he actually enjoys and is satisfied with veggie-topped pizza and vegetarian chili. He’s healthy, trim and has plenty of energy (as evidenced by the Facebook photos of all the work he’s done, rather than his behavior during the occasional weekend at home). This new way (for him) of eating—call it “casual vegetarian”—makes sense not only for someone working for a conservation-promoting organization but for all of us. Americans eat about 1/2 pound of meat daily—roughly twice the global average and roughly twice the amount recommended by the USDA. Skipping meat, even a couple times a week, may be a boon for your health, as reducing meat in your diet is linked with everything from heart health to protecting against cancer. If you, too, are a casual vegetarian, why not take the challenge and try turning some recipes you might usually buy meat for into meatless meals instead. Not all burgers have to be beef; not all stuffed potatoes have to be topped with bacon. The EatingWell Test Kitchen has developed fast and flavorful vegetarian recipes, ready in 30 minutes or less, you can plan to try any day of the week. You’ll be enjoying the results so much you won’t feel anything is missing. Here’s a week’s worth of fast, easy recipes to get you started. 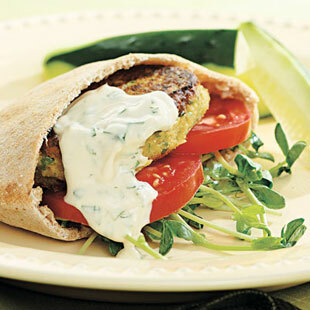 Rather than a heavy, fried falafel, here’s a lighter version of the pocket sandwich: a chickpea patty served in a whole-wheat pita with a flavorful and lower-in-fat tahini sauce. Make it a meal: Serve with a tomato-&-feta salad or parsley tabbouleh. Wash it down with an organic Wit Bier from Wolaver’s. For a satisfying last-minute supper, it’s hard to beat a sweet potato zapped in the microwave. The fragrant filling of beans and tomatoes adds protein. Be sure to eat the skin, which is full of fiber, as well. Here we take basic lasagna ingredients—ricotta cheese, pasta and tomatoes—and skip the layering and long baking time to make a super-quick and satisfying meal for the whole family. To cut down on prep time, look for presliced mushrooms. Serve with: Steamed broccoli and whole-grain baguette. Our healthier eggplant Parmesan sandwich uses tender, smoky grilled eggplant instead of fried, so it has a fraction of the fat and calories. To make these sandwiches a cinch to prepare, make sure to have all your ingredients ready before you head to the grill. This combination may seem unusual—until you try it. The sweet-tartness of the apple, creaminess of the cheese and bite of the sauerkraut work together beautifully in this easy hot sandwich. Serve with oven-roasted potatoes or a green salad. Like what you eat? Add a comment to the recipe page and spread the word.